United Nations High Commissioner for Human Rights Navi Pillay. 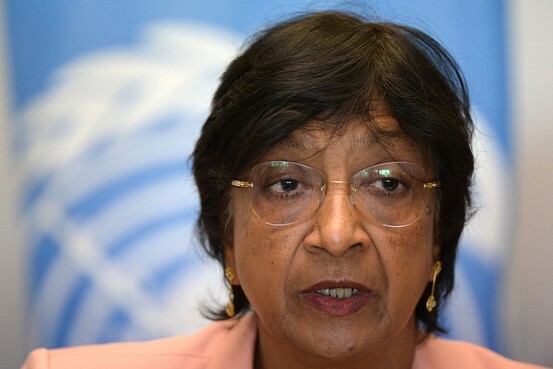 “It pains me to see that these courageous women, who have been fighting for their rights, are passing away one by one, without their rights restored and without receiving reparations to which they are entitled,” said U.N. High Commissioner for Human Rights Navi Pillay in a statement Wednesday. Ms. Pillay, a South African national whose tenure as commissioner will soon come to an end after six years, criticized the lack of “any public rebuttal by the government” of Japan against “denials and degrading remarks” by public figures. When asked Thursday about the newest U.N. condemnation–just last month, the U.N. Human Rights Committee advised Japan to investigate and prosecute wartime perpetrators–Japan’s top government spokesman, Yoshihide Suga, reiterated the government’s longstanding view. “Our country’s consistent position has been that the issue of comfort women has been settled between Japan and South Korea” in a 1965 treaty, he said. Mr. Suga said Japan has provided aid to the women “from a moral standpoint.” Japan will “continue to patiently explain its position,” he said. Ms. Pillay’s comments were the latest to keep the comfort-women issue on the front burner, nearly 70 years after the war ended. This week, South Korea said it would publish its first comfort women white paper—in English, Chinese and Japanese. Additionally, Japanese conservatives claimed vindication this week when the liberal daily Asahi Shimbun retracted some stories it ran in the 1980s and 1990s that seemed to back allegations about the imperial army abducting Korean women. because these women deserve justice and an apology.